Built with a quad-core processor, an AES-NI and AES 256-bit hardware encryption engine, and Btrfs file system support, the DiskStation DS1819+ 8-Bay NAS Enclosure from Synology is a scalable desktop system that provides performance and expandability, allowing for seamless expansion and upgradability to satisfy growing businesses. Further boost storage performance by installing a dual M.2 2242/2260/2280 SATA/NVMe SSD card for high-IOPS system caching or enhance network speeds by adding a 10GbE NIC. This NAS is equipped with eight drive bays that are capable of natively supporting 3.5" SATA hard drives, as well as 2.5" SATA hard drives and SSDs for data storage. Using its eight drive bays, this NAS will allow you to store and share many files, including videos, music, photos, and documents with up to 2048 user accounts and 1000 maximum concurrent connections, or 2000 if the memory is upgraded. The DS1819+ runs on the Synology DiskStation Manager (DSM) OS, which is a browser-based operating system which helps to simplify managing your Synology NAS. Its CPU is a 2.1 GHz Intel Atom C3538 Quad-Core and its 4GB of DDR4 RAM, which be upgraded to 32GB, allows frequently-used files and applications to be quickly accessed. The NAS is capable of achieving sequential read speeds of up to 2045 MB/s and sequential write speeds of up to 656 MB/s. Also featured are four USB 3.0 Type-A ports and two eSATA port which allow it to be connected to your Windows or Mac system, and network connectivity is achieved via the four Gigabit Ethernet ports that support Link Aggregation and Failover, allowing your stored data to be shared with users throughout the network. 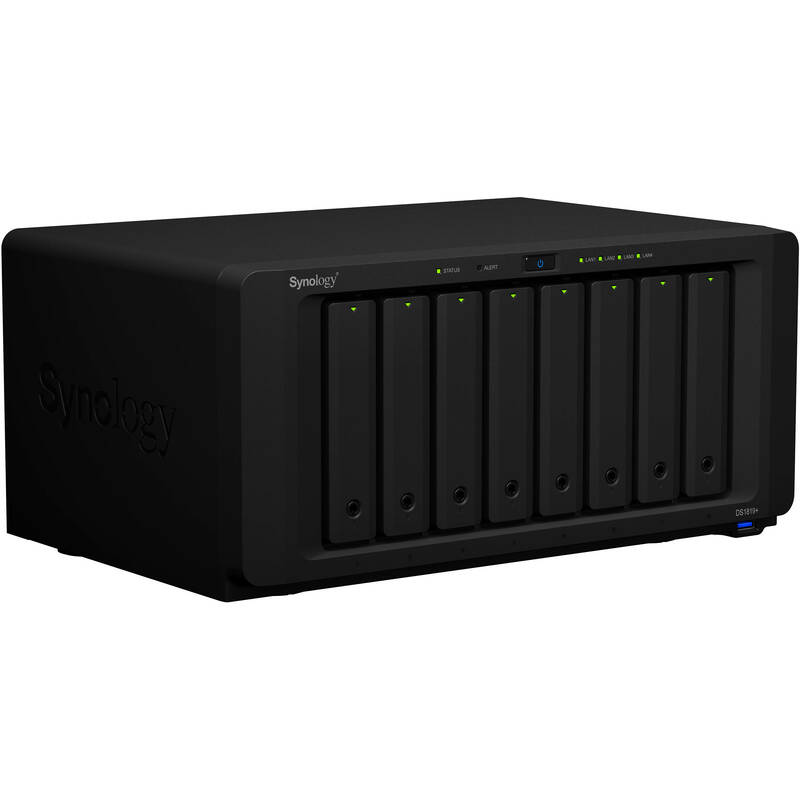 For those who require RAID support, the DS1819+ supports RAID 0, 1, 5, 6, and 10, as well Synology Hybrid RAID and Basic RAID, each of which offers performance, data redundancy, or a combination of both. For those who do not require a RAID, JBOD is also available, allowing each drive bay to be individually utilized. The DS1819+ is engineered to be energy efficient. Not only does it offer two 120 x 120mm fans to help keep the system running cool always, its noise dampening design of 22.2 dB(A) makes for quiet operations. The server supports numerous scheduled power on / off cycles and hard drive hibernation to further minimize power consumption and operation expenses. The Synology DiskStation DS1618+ 6-Bay NAS Enclosure operates on 100-240 VAC at 50/60 Hz and includes an accessory pack, an AC power cord, and two RJ45 LAN cables. If you need to expand its storage, the DS1819+ can be connected to two DX517 expansion units. Protection is provided by a limited 3-year hardware warranty. The DS1819+ comes with four Gigabit Ethernet ports and one PCIe expansion slot, providing configuration flexibility to satisfy your intensive workload demands. Break through data transmission bandwidth with a certified network interface card. Four integrated Gigabit Ethernet ports support failover and Link Aggregation. The DS1819+ integrates various backup applications to safeguard your important data on virtually any device with an intuitive user interface and durable storage technologies. Comprehensively back up your data to a local shared folder, an external device, another Synology NAS, an rsync server, or a public cloud to help ensure data safety. Safeguard your Windows system with Cloud Station Backup and back up data stored on macOS to Synology NAS with Time Machine. Synology iSCSI storage fully supports most virtualization solutions to enhance work efficiency with an easy management interface. VMware vSphere 6 and VAAI integration helps offload storage operations and optimizes computation efficiency. Windows Offloaded Data Transfer (ODX) speeds up data transfer and migration rate. OpenStack Cinder support turns your Synology NAS into a block-based storage component. Box Dimensions (LxWxH) 17.9 x 14.2 x 11.3"
DiskStation DS1819+ 8-Bay NAS Enclosure is rated 4.4 out of 5 by 5. Rated 3 out of 5 by Jonah from An OK showing from a favorite company Its not broken, and its not bad exactly, but there are so many easy and cheap things they could have done to make it vastly better. As a previous very happy 1812+ owner, I just wish they had done more to improve this platform in the last 7 years. - dont force the user to chose between 10Gbit and NVMe cache. Just have 2 PCIe slots, or find a board with built-in NVMe - remove pointless nagware about 16GB dimms not being qualified. Nobody wants to buy Synology branded $330 per dimm ECC 260pin ram, and tons of non-ECC 16GB dimms work just fine with this unit. Its a sales pitch disguised as an error message. - zero effort put into QVL for compatible ram and 10g cards. They basically force you to buy their extreme markup hardware, or guess. Dont try to be Apple. - still running a $60-ish Atom proc when all kinds of amazing Xeon D SOCs exist now. In Summary, this could have been the quiet, desktop form factor of the rs1619xs+. It should have been that, but instead we have this weird mix of dated, old parts. On the plus side, DSM continues to get better all the time, and I really like that its cleaner, and less busy than the QNAP OS. Rated 5 out of 5 by Derek from Amazing storage solution for Photographers... Upgraded from a Drobo 5D to this unit and am so happy I made the switch. Super easy setup and software to navigate for non NAS tech savy folks, such as myself. I upgraded my unit with the 10GB ethernet card and am running 10TB Seagate Ironwolf drives and am consistently getting 350-450 MB/S read speeds and 500-550 write speeds. Plenty fast for photo editing and it works great (faster) with lightroom and photoshot as a direct attached option. Quick downside related to the Ironwolf drives... They are loud. I had to move the NAS to a different spot to cut down on the noise. Rated 5 out of 5 by Brian from Great NAS Unit. My second one to back up the backup! Been running a Synology 1815+ for a couple of years now for back up and employees files in a central location. I purchased this one to back up the 1815+ and it works perfectly and was very easy to configure to do this. The Synology software is a bit more friendly for less tech-savvy personnel. So I know have our servers and employee files backed up in four locations using the Synolgy units. The 1815 has the files stored on it with a Synology Hybrid raid setup allowing for a two drive failure. It then backs up all those files via Cloud Synch to a Dropbox Business account. Then using Hyper Backup I backup the 1815 to the 1819 which is placed in the opposite end of the building so it is physically separated from the 1815 in case of damage to one area of the business from fire or water for example. I then plug in two USB drives and backup the server backups to one and the employee files to another using the Synology USB backup app. I set it to dismount after synch and then unplug the drives at the end of the day. This gives some protection from Ransomware. The Synology software makes this pretty easy to do. Rated 5 out of 5 by Robert from Works great for NAS and media storage I use this as a NAS for photos and video and also to stream media as a DLNA server. I do not have it transcoding but for my purposes it has been working great. Easy to manage the storage and to add drives. I started with 6x 12 TB HDD and I have added another 12TB so far. I also upgraded the RAM to 32GB. I have it configured with RAID 6 with one large volume configured with a BTRFS file system. Rated 4 out of 5 by Eric from Great home of SMB NAS SHR makes a flexible, scalable system for most home office, SMB, and especially photographers. RAID IS NOT A BACKUP, but SHR allows you to add drives as you go and have resiliency and reliability if a drive fails. Hyperbackup has gotten better and is snap for backing up to a second Synology NAS although it is still slow. You can automate your backups so you dont have to remember to do them. I upgraded from a 1813+ and it is noticeably faster, with more memory that is also upgradable. Forewarned, Synology support is through email only and it is less than ideal, thats why it only gets 4 stars. I have had to go head to head with them on some features in their software which doesnt work as expected even though it is built on an open source platform. Their software changes expected behavior you need to navigate through. Their tech team will ask for remote access and then poke around in your system, sometimes changing configs without clearing it with you first, which compromised one of my datasets once. After I called them out on it, they made goo don it though.